Hi everyone! 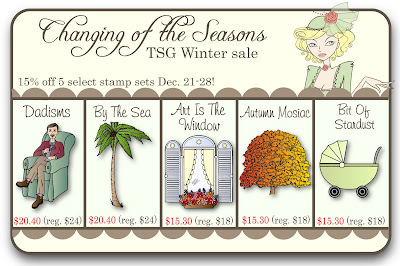 Welcome to Day 3 of TSG new release sneak peeks! Did you come here from Sandra's blog? I hope so. If not, please head on over to the TSG blog to start today's hop. We are showing two stamp sets today. The first one is called " Love Birds". This set showcases a number of prim-and-proper birdies just dying to enhance your lovely creations. 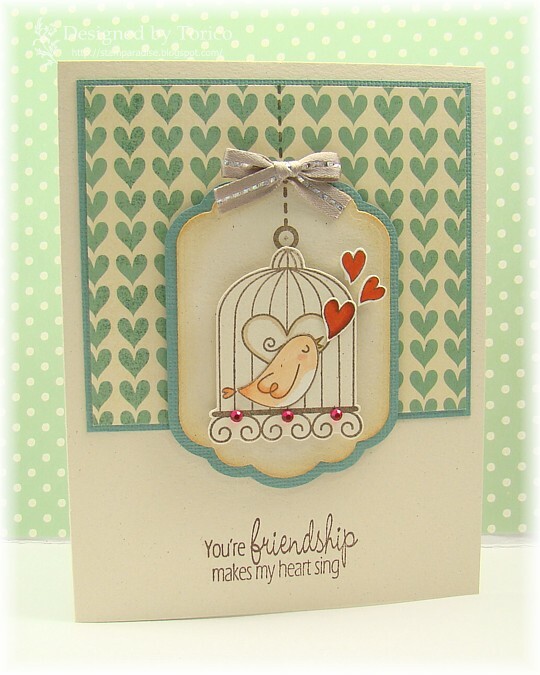 With accents like a scroll-like bird cage, beautiful branch, and whimsical sentiments, this stamp set will make your heart got pitter-pat! 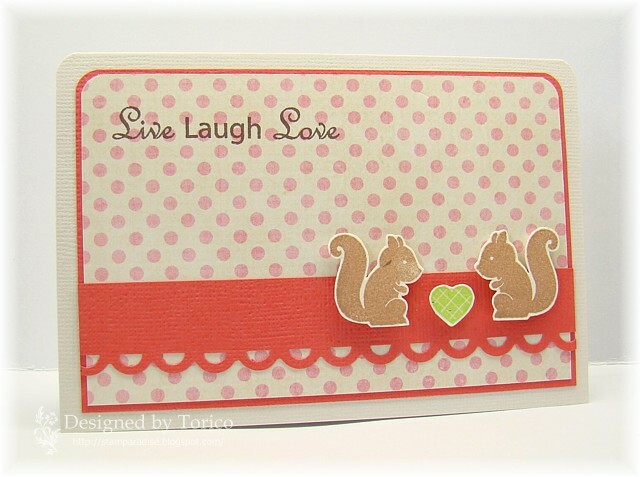 *Edit* As some of you may have noticed, there is a grammatical error on the sentiment I've used on this card. It was caught and the replacement stamps are already on their way! 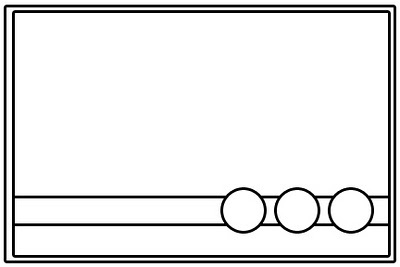 The new sets will have the corrected sentiment. The next set is called "Sentimental". 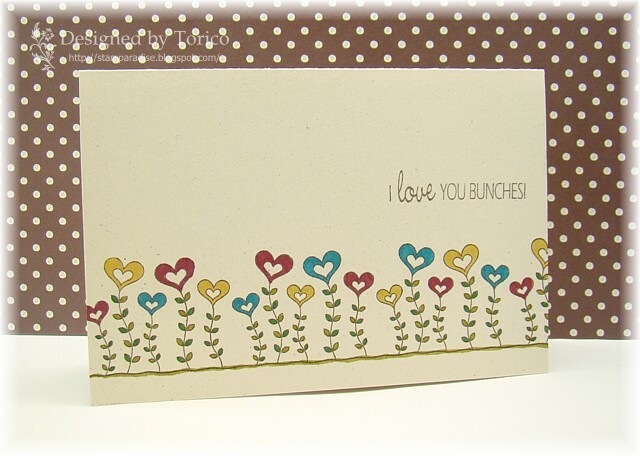 “Sentimental” is a must-have set for any card maker! A combination of type print and the scriptive handwriting of our very own Julie Lacey are showcased beautifully. These sentiments are not only versatile, but can be also used for everyday creations. I haven't got this set on my hand yet, but I know that I MUST have it!! You have a chance to win the Sentimental and Love Birds stamp sets! 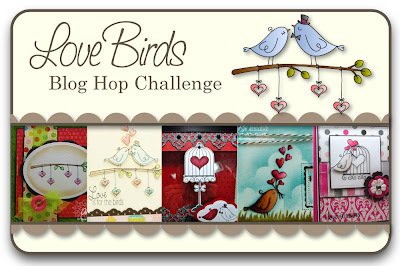 Go to each of the Trendsetter’s Blogs and leave a comment on their Sentimental/Love Birds Blog Hop Challenge post. 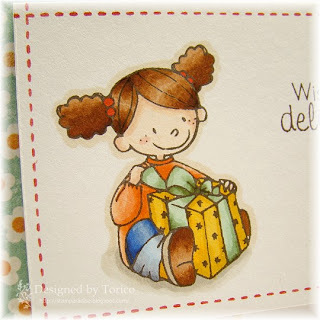 After you have finished, return to the TSG Blog and add your name to the Mr. Linky at the bottom of the Blog Hop Challenge post. 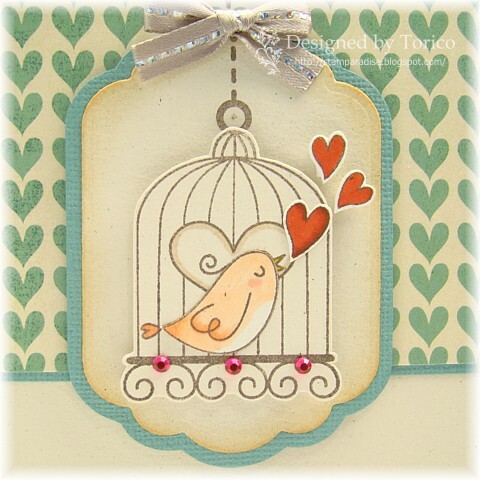 A winner will be chosen randomly using a random number generator to receive their very own “Sentimental”/”Love Birds” stamp set. The winner will be announced Saturday (Jan. 1st) during the Release Party Chat. 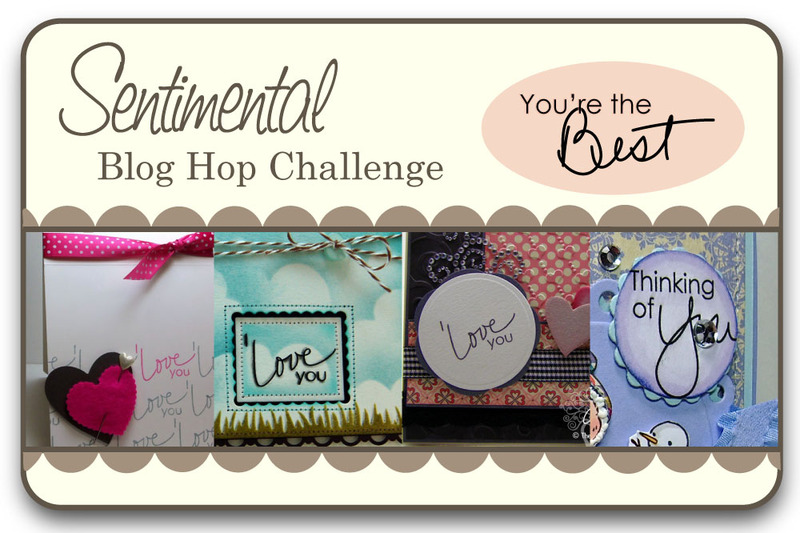 Here is the end of this month's Blog Hop Challenge. Hop back to the TSG blog to add your name to the Mr. Linky. Thank you for atopping by today. I'm taking a New Year's break for a few days. I wish all of you a Happy New Year! 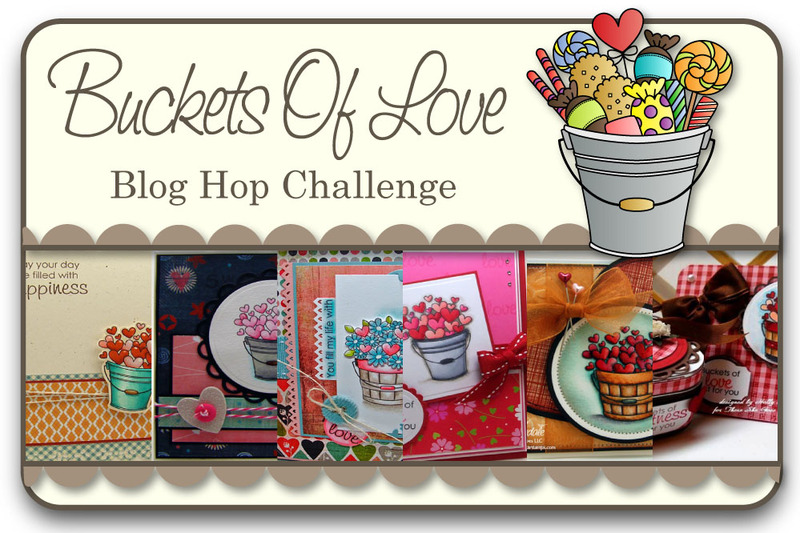 TSG Blog Hop Challenge Day 2 : "Buckets Of Love"
Hi everyone! Welcome to Day 2 of TSG new release Blog Hop Challenges! 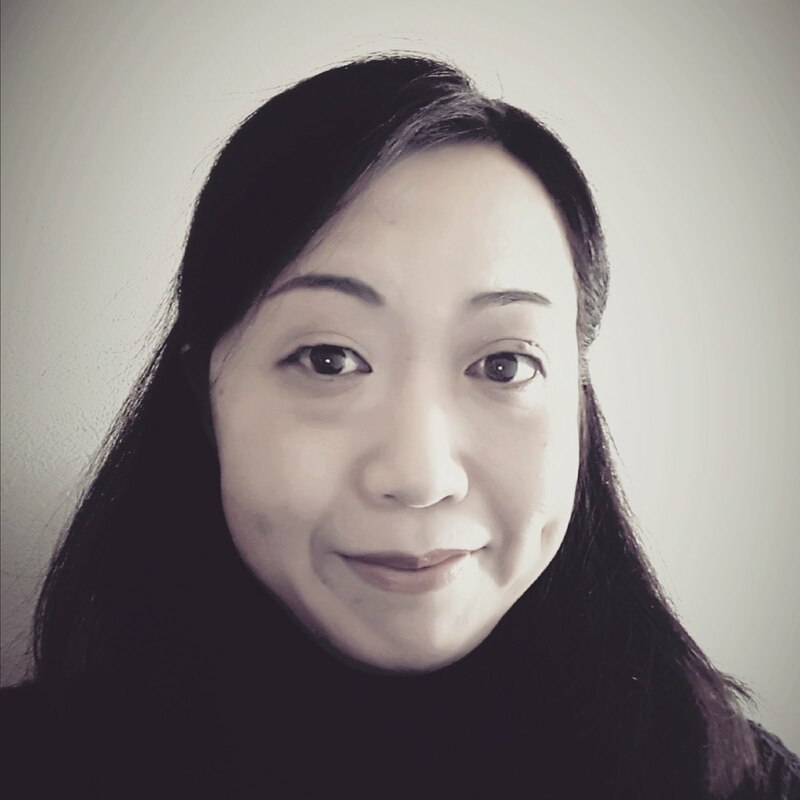 If you came here from Sandra's blog, you are in the right palce. But if not, please head on over to the TSG blog to start the hop. 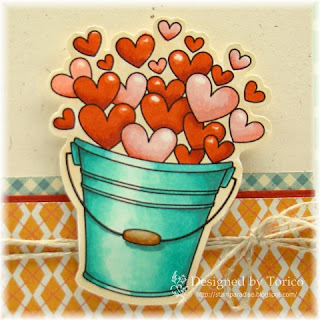 Today we are showing " Bucket Of Love" set. 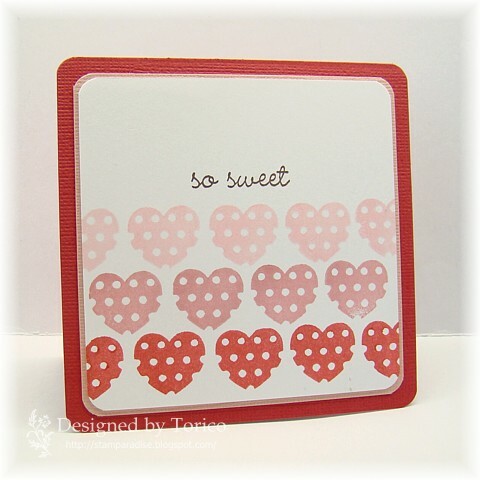 With Valentine’s Day around the corner, you will definitely want to invest in a stamp set that is not only whimsical, but also versatile. 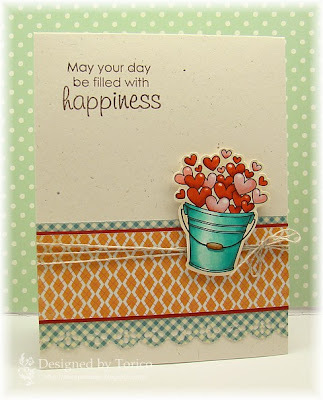 This set features a bucket and a barrel that can be filled with all sorts of goodies (and the sentiments are to die for as well)! You’ll enjoy hours of creating and coloring with this fabulous set! You have a chance to win the “Buckets of Love” stamp set! Go to each of the Trendsetter’s Blogs and leave a comment on their “Buckets of Love” Blog Hop Challenge post. After you have finished, return to the TSG Blog and add your name to the Mr. Linky at the bottom of today's Blog Hop Challenge post. A winner will be chosen randomly using a random number generator. And the winner will be announced Saturday (Jan. 1st) during the Release Party Chat. 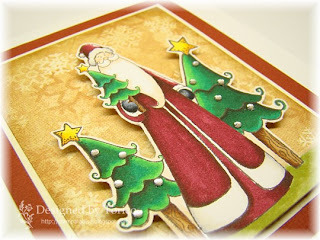 Here is the end of today's blog hop. Please head back to the TSG blog and add your name to the Mr. Linky! 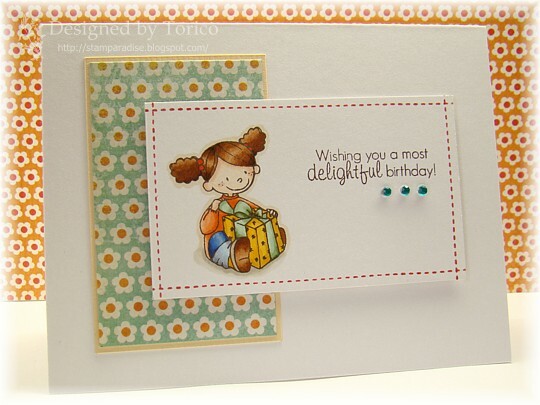 Tomorrow we will be showing two more stamp sets that shoul be released on Saturday. Make sure you won't miss it! 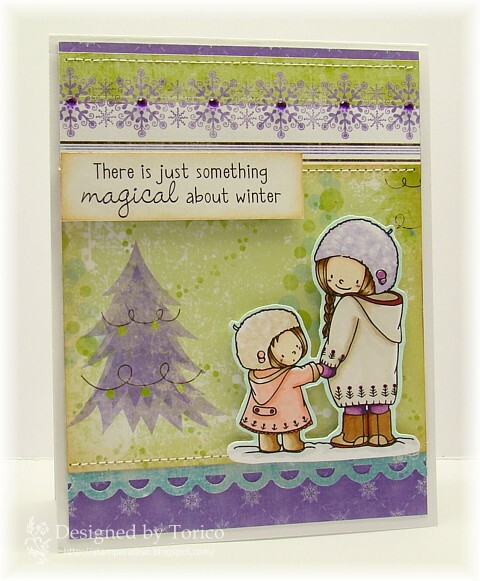 The stamp set we are showing you today is called " Wonderfu Winter Wishes". 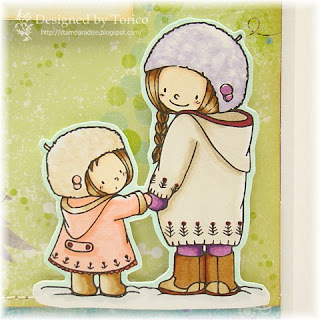 For this set, I illustrated some images of children enjoying their snowy environment. It never fails, just when you think that you have sent out Christmas cards to everyone on your list, you will receive one in the mail that makes you say 'I forgot to send them one!'. This stamp set is perfect for making cards to send after the holidays to let those people know that you care (even if you did forget to send one earlier hee hee)! You have a chance to win the “Warm Winter Wishes” stamp set! 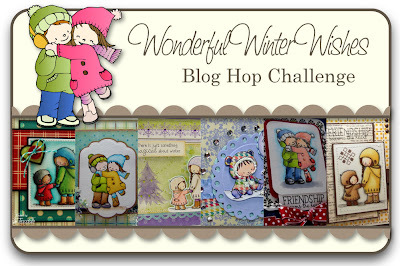 Go to each of the Trendsetter’s Blogs and leave a comment on their “Wonderful Winter Wishes” Blog Hop Challenge post. After you have finished, return to the TSG Blog and add your name to the Mr. Linky at the bottom of today's Blog Hop Challenge post. A winner will be chosen randomly using a random number generator to receive their very own “Wonderful Winter Wishes” stamp set. The winner will be announced Saturday (Jan. 1st) during the Release Party Chat. Here is the end of today's hop. Please hop back to the TSG blog and add your name to the Mr. Linky! Thank you for stopping by today. See you tomorrow!! Happy Monday everyone! I hope you all had a wonderful Christmas. 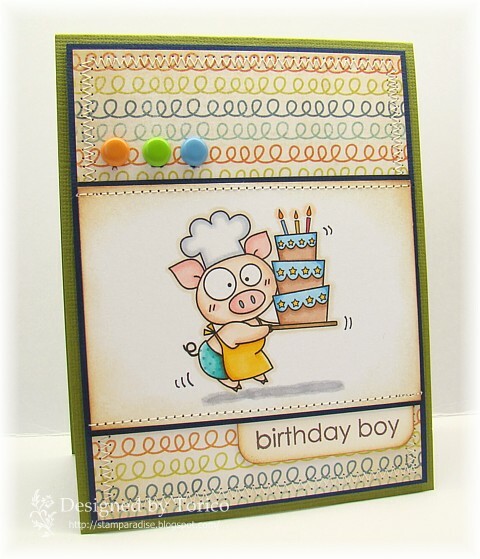 Today I'm so excited to be a part of the Birthday Blog Hop for Jodi! 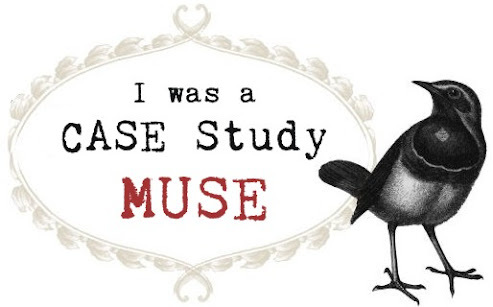 If you came here from my super talented friend, Iwona's blog, you are in the right place. 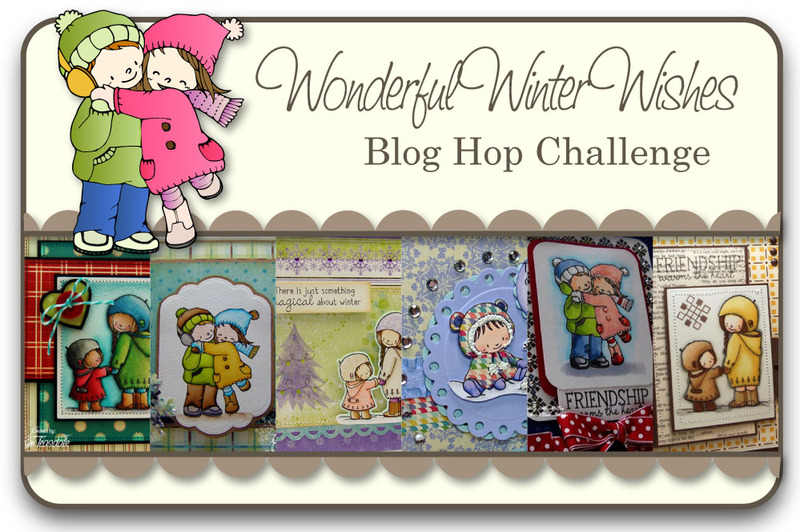 But if not, head over to Karen's blog to find the details and the entire list of today's hop! May your day be filled with happiness! For today's birthday card, I used Flowers Of Happiness set (TSG) and Birthday Bash Sentiments set (PTI). I stamped the flower image twice, colored them with Copic Markers, cut them out and layered. 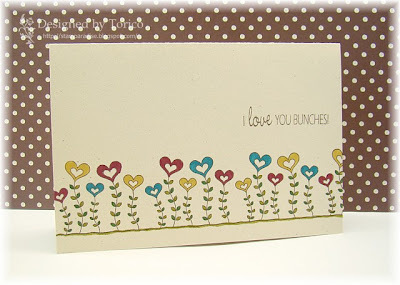 Then I combined it with some patterned paper and cardstock. The sentiment banner was sewed on the polka dot panel with red thread. Hi everyone! Are you getting ready for Christmas?? I'm working with a bunch of Nengajo (It is Japanese traditional New Year's postcard) now. I want to finish them by this weekend, and besides, I want to enjoy Christmas too! Eeeeeek! 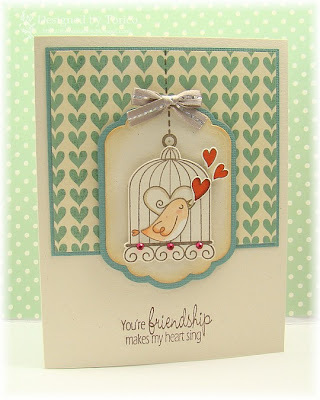 I managed to have a little stamping time yesterday, and here is a card I made using CPS 198 sketch. I'll be back on Monday. And There She Goes sneak peeks begin on Tuesday, so, make sure you won't miss it! Thank you for stopping by. I hope everyone have a Very Merry Christmas! 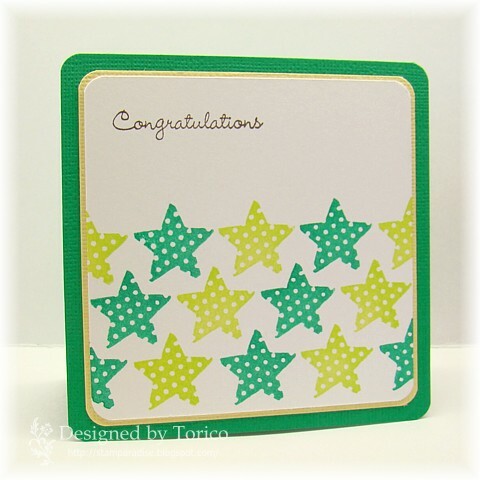 Iit has been crazy busy days for me and it is hard to have a little time for stamping. 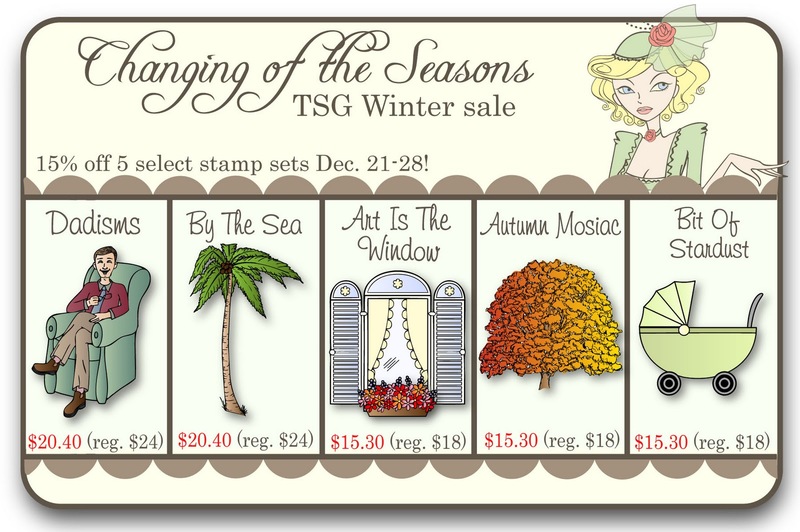 But, I popped in to let you know that TSG Winter Sale starts today! This sale will run from December 21st until the 28th. All 5 stamp sets below are 15% off of their regular price. I'd like to share two quick cards that I made using Bit of Stardust set. Hello everyone! 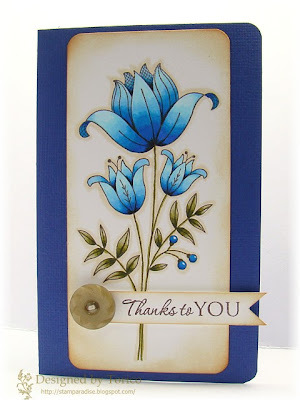 I'm sharing a simple thanks card today. This card was based on this weeks CPS sketch (CPS 197). I really like this Hero Arts Stamp (Tall Flower), but unfortunately, I didn't have any chance to ink it up till today. I truly enjoyed coloring this image and love how it turned out! Birthday Boy --- New digi! 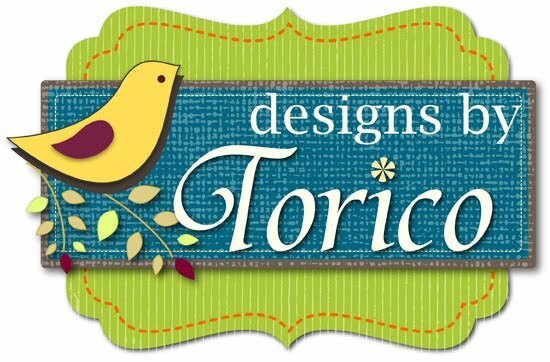 I uploaded a new digi image on my another blog, Torico's Digital Gallery. 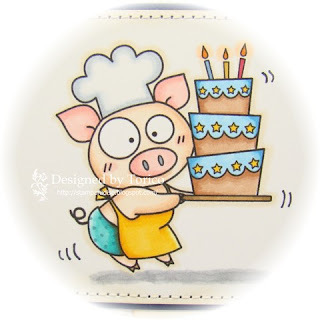 Today I'm sharing a birthday card using it. This card is for my daughter's friend.﻿ He is turning 10 on Saturday, and my daughter is invited to his birthday party. After I finished this card, I remembered that he is a twin! Oh my... I have to make one more card for his twin brother! By the way... The patterned paper I used reminded me of a pig's tail. It's perfect for the image, isn't it? LOL! 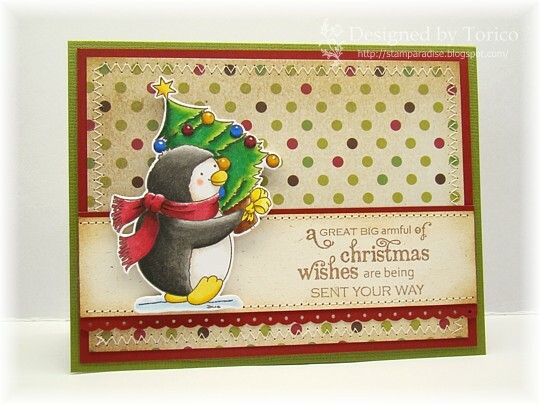 Today I'm sharing two CAS Christmas cards that I made this weekend. 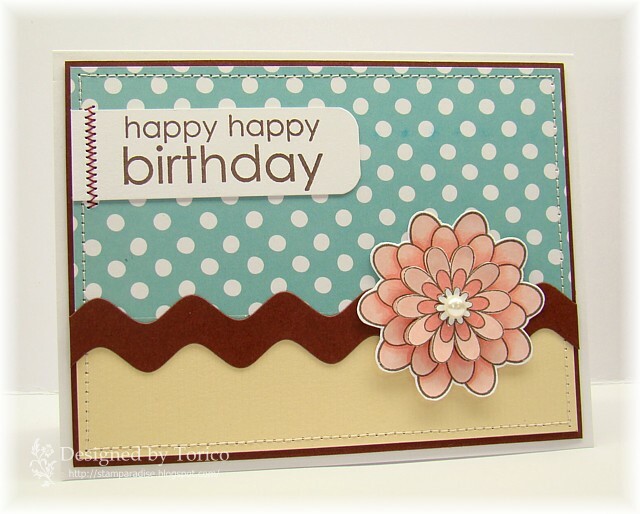 Both cards were used Big Blooms - Poinsettias set (Waltzingmouse Stamps). 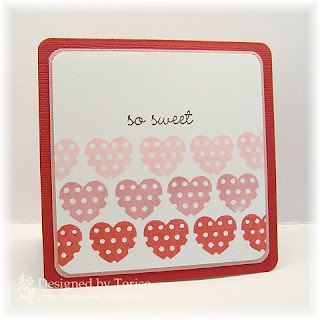 I stamped the polka dot background which is from Off Beat Background set (Waltzingmouse Stamps) with Muscat ink (Versa Craft). 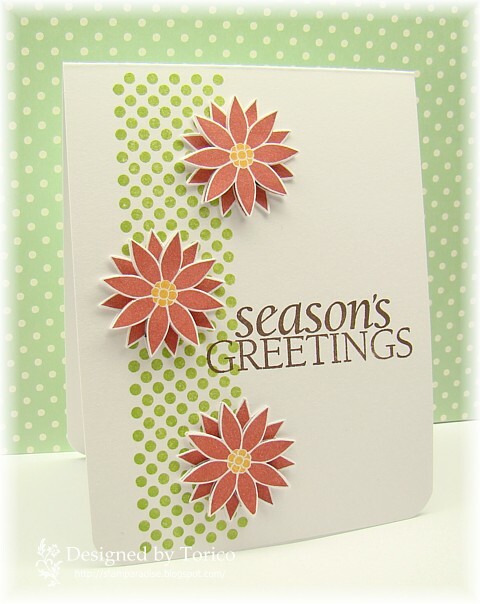 The poinsettias were stamped with Brick ink (Versa Craft), cut out and layered. 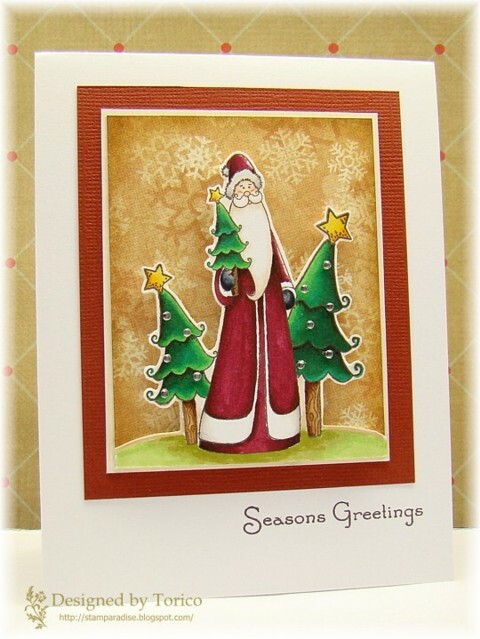 After I adhered the poinsettias, I stamped the sentiment (from Hero Arts) with Jumbo Java ink (Versa Magic). 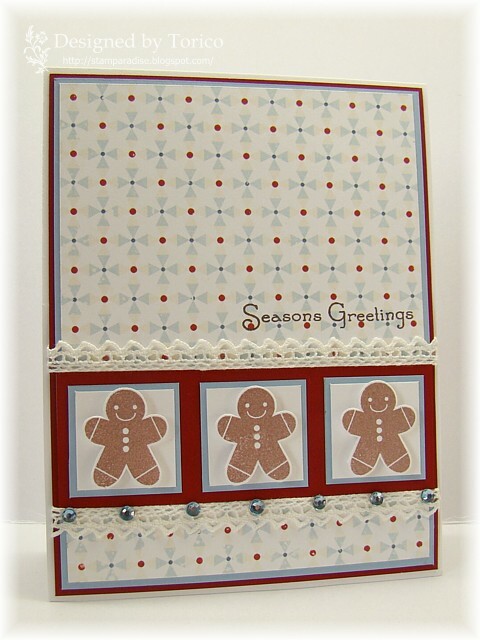 I was imaging a patchwork quilt while I was making this card. 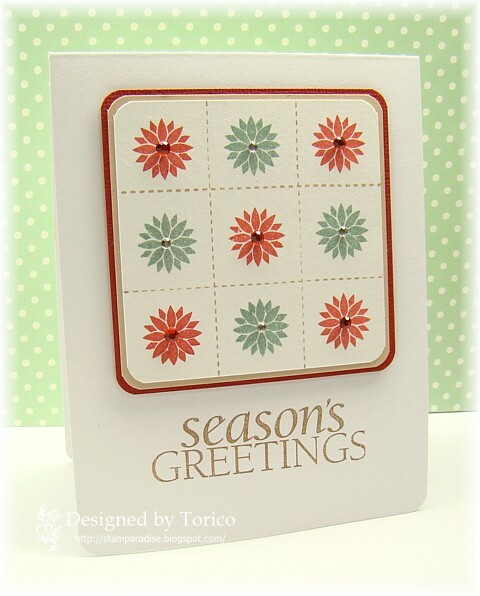 The poinsettias were stamped with Sakuranbo and Moss ink (Versa Craft). In Stitches set (There She Goes) was used for faux stitch. I added some tiny blinkies to finish the card off. I finally finished Christmas cards for international friends and sent them out yesterday! Phew.... I still have to make a few Christmas cards for my Japanese friends, but honestly, I got tired to make Christmas cards. LOL! So I needed to take a break and decided to make a CAS card using a Hero Arts stamp. Thank you for visiting. Enjoy your weekend! OK... I have to head back to my craft room to make some more Christmas cards!!! 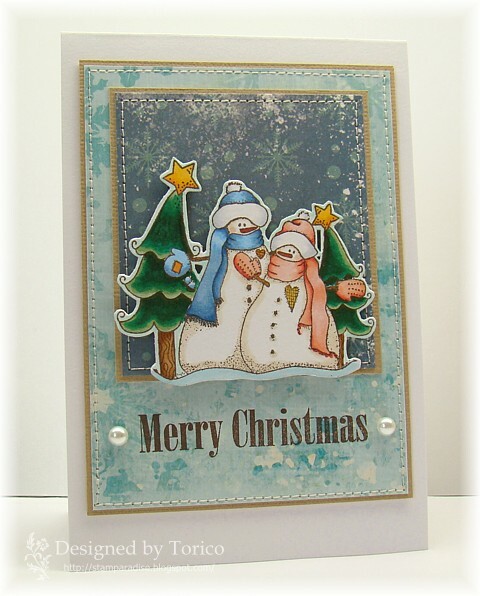 Today I'd like to show you one of the cards I made this weekend. I'm very satisfied with the CAS look of this card. Also, it was very quick and easy to make! I know that I have to make a few more cards in the same design! Haha!